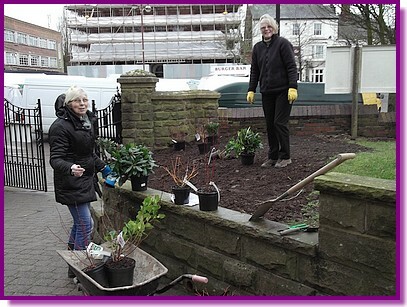 This picture is of Mary Hawkins and Val Rennie on February the 28th starting to plant the areas either side of our church gates which have been cleared, freshly dug and prepared by the Council. 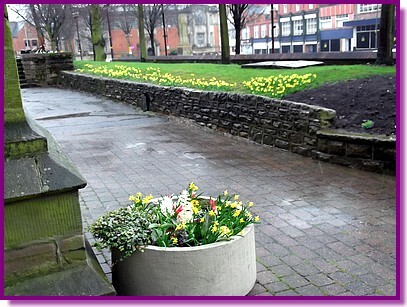 The plants have been bought using part of the £300 Council grant provided by Councillor Glennice Birkin for the Friends of St Mary’s Churchyard to use. 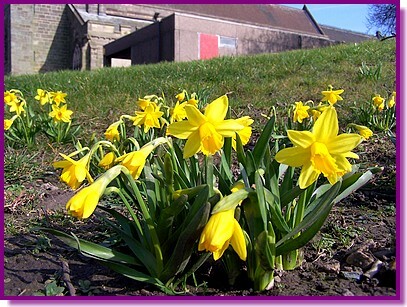 Over the past few weeks there have been other things springing up all around the churchyard… mainly snowdrops and daffodils, when this was written, but tulips and other things were also starting to come through. Several more members of the ‘Friends’ team were working hard on the 28th too pruning and tidying other areas of the church grounds. It is making a real difference to the feel of the churchyard – it is lovely to see the area coming to life and being cared for. I, for one (who doesn’t know a thing about plants! ), am really looking forward to what all the new plants will look like when they have become established and started to blossom. If anyone is interested in joining the ‘Friends of St Mary’s Churchyard’ we usually meet for about an hour or two on the last Saturday of the month from about 10am. You don’t need to know what you are doing as someone will point you in the right direction. However, if you have any suggestions or ideas these will be welcomed. We also have a meeting about every 2 months to discuss what is to be done, although these meetings aren’t compulsory.